After serving for 25 years as conductor of the Karl L. King Fort Dodge Municipal Band, Reginald R. Schive has announced his resignation. He has cited "health reasons" for his resignation at this time. Schive is a Fort Dodge native, and had been a member of the King Band since 1946. After graduating for Fort Dodge Senior High in 1948, he earned his Bachelor's degree from Iowa State Teacher's College (now University of Northern Iowa), and his master's degree from the University of Colorado. Chairman of the Band's Board of Directors, Duane (Oley) Olson made the following comments. "Reg has had a distinguished career as musician, composer, arranger, and conductor, and we will greatly miss his leadership, " Olson said. "He has made outstanding contributions to the King legacy in our state." Reg Schive has served music education well in the state of Iowa. He was an adjunct professor of woodwinds at Morningside College in Sioux City until his retirement last spring. He has taught and directed bands for more than 50 years at Alta, IA; the University of Nebraska in Omaha; Humboldt, IA; Buena Vista College in Storm Lake; and Sioux City West High School. He was elected to the Iowa Jazz Educators' Hall of Fame and has been the musical conductor of the Fort Dodge Civic Glee Club from 1974 to 1985. 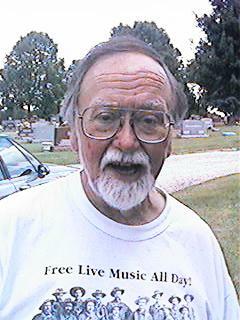 He was also a member of Windjammer's Unlimited, and was named a Webster County "Special Achiever" in 2001. His summer music camp in Jazz education, which bears his name, has been held during June at Lake Okoboji for many years. Schive has been a part of several outstanding band events during his tenure as director of the King Band. Most notable include the 1991 concert commemorating the Centennial Anniversary of Karl King's birth; and the two week stay in Washington, D. C. in 1996, where the King Band performed daily concerts as part of the Smithsonian Institute's celebration. Applications will be taken for the conductor's position, and will be screened by the band's Board of Directors. Under the Band's by-laws, final selection of a conductor will be made by a vote of the band members. The King Band continued their winter season concert schedule. Keith Altemeier, the assistant director of the Band, conducted the February 23 concert. Other concerts were scheduled for March 16 and April 13.